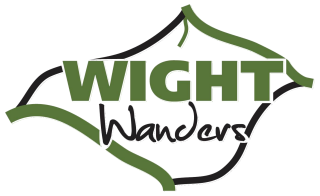 The Isle of Wight is located just off the south coat of England and is linked to the mainland ports of Lymington, Southampton, Portsmouth and Southsea by vehicle ferries, high speed passenger catamarans and hovercraft. 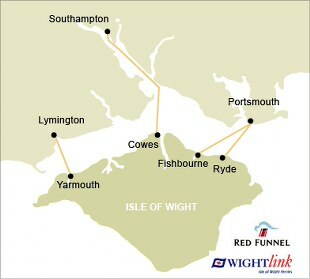 The Isle of Wight has three major ferry operators and the information about these and links to their web sites can be found below. The main ferry terminals of Southampton and Portsmouth and both linked to London by fast rail and road services, the journey time taking between one and two hours. The London terminus is Waterloo Station. Tickets can be purchased straight through to some Island destinations, to include the ferry crossing. For a walking holiday you'll always remember, no Island comes close. Each season has its own special charm. The Island boasts 60 miles of spectacular coastline, with picturesque coves and beautiful bays of golden sand with safe bathing. Known as the "Garden Isle", this jewel of England indeed resembles a diamond in shape and is a treasure trove of historic and prehistoric interest. Di nosaurs, ancient tribes, Romans and monarchs throughout the ages have left behind a fascinating trail into the past. The Island was once a frequent haunt of many eminent and historically important people including Charles Dickens, Lewis Carroll, JMW Turner, Henry VIII and Queen Victoria. The Isle of Wight is some 23 miles west to east, from the Needles to Bembridge, and 13 miles north to south, from Cowes to St Catherine's Point. 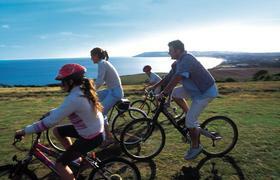 This, the smallest, and perhaps the most geographically diverse, of England's counties covers 147 square miles and is bounded by about 60 miles of coastline an ideal Cycling holiday destination. Within this watery border of the Solent to the north and the English Channel to the south, lies an "England in miniature". The natural processes of deposition, folding and erosion during the last 120 million years have resulted in the rich variety of the Island's surface geology. The results are kaleidoscopic contrasts in the Island's scenery encompassing open download, beech woods, conifer forests, grazing land, wide sandy beaches, seer cliffs, rocky coves, creeks and estuaries. John "Earthquake" Milne (1850 - 1913) was the father of seismology. He invented the horizontal pendulum seismograph and set up the world's first centre for seismology in Shide. The Isle of Wight only became an island 8,000 years ago at the end of the last Ice Age. Sir Christopher Cockerell spent 2 years from 1959 inventing the hovercraft in East Cowes. It was built at Saunders Roe and launched on 31st May 1959. Guilielmo Marconi moved to the Island in 1896 after the Italian post office refused to test his new wireless equipment. In 1897 he erected a 40 metre tower at Alum Bay and transmitted to Poole, nearly 20 miles away. The Isle of Wight can be said to have a climate all of its own. With relatively mild winters and high light intensity, the local climate borders on sub-tropical and allows many Mediterranean-type plants, trees and even vineyards to flourish in the open air.